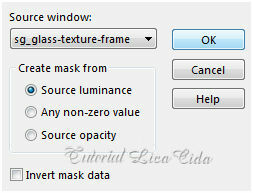 Preset Illumination\Lights_2bllc ( Guardar em sua pasta de Presets My PSP Files). Tubes:Tocha24017 \ tube calguismist01082012 \tube aclis_vases_01_10_07_2012. 1- Abrir nova imagem transparente de 950 x 650. Preencher com o gradiente formado pelas cores escolhidas acima retirados do misted. Configurar Rectangular : Angle 0 e Repeats 2. Invert marcado. CP=H e V 50 \ FP=H e V50. 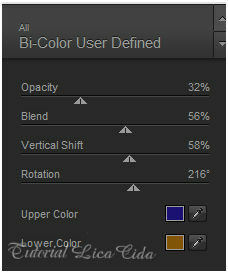 2- Nova Layer\ Preencher color=#ffffff. Emboss3 . Layer\ Merge\ Group. 3- Seleção Personalizada ( tecle S ). Ativar a Raster1. Promote Selection to Layer. Layer\ Arrange\ Bring to Top. Selections\ Select All. Selections \Modify Contract = 152 pxls . Invert \ Delete . Selections\ Select none. Com a ferramenta Magic Wand _ Default, selecione a parte externa do efeito. Invert. Selections \Modify Contract = 22 pxls .Delete. Edit Copy no tube calguismist01082012 \ Edit Paste Into Selection . Layer\ Merge Down. Selections\ Select none. Effects \ 3D Effects \ Drop Shadow 1 \1 \ 75 \ 30,00. Color=000000. Effects\ Illumination Effects\ Preset Illumination\ Lights\ 2bllc. 4- Seleção Personalizada 2 ( tecle S ). Edit Copy no tube calguismist01082012 \ Edit Paste Into Selection ( deve estar na memória) . 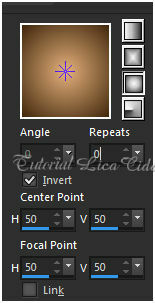 Repetir:Effects\ Illumination Effects\ Preset Illumination\ Lights\ 2blc. Layer\ Arrange\ Move Down. Selections\ Select none. 5-Edit Copy no deco B - 043 \Paste As New Layer. 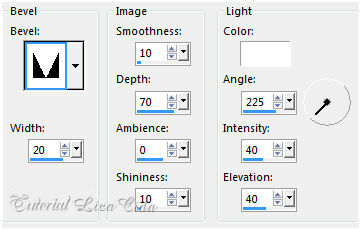 Efects\ Image Effects\ Offset... H= (menos) -194 \V= 155 . Custom e Transp. 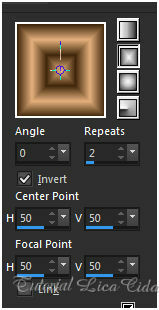 Effects\ 3D Effects\ Inner Bevel. 6-Ativar a cor do seu foreground e procurar um tom bem mais claro ( usei: #f9ecdf ). Use a ferramenta Change To Target. Pincele na Raster1 \ outras layers opcional . 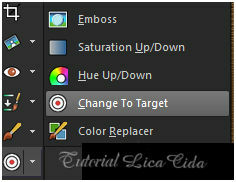 Ainda na Raster1...Plugin Nick Software\ Color EfexPro 3.0\ Bi-Color User Defined. 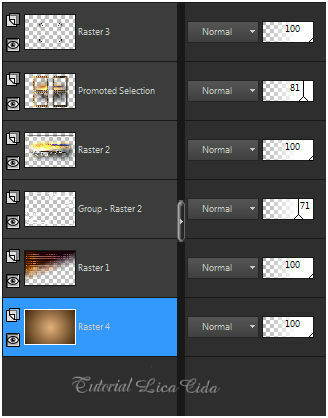 Em seguida Plugin DC Layer \ SideMerge. 7- Nova layer\Send to Bottom. Preencher com o gradiente formado pelas cores acima. Configurar Sunburst : Repeats 0. Invert marcado. CP= H e V= 50 \ FP= H e V=50. 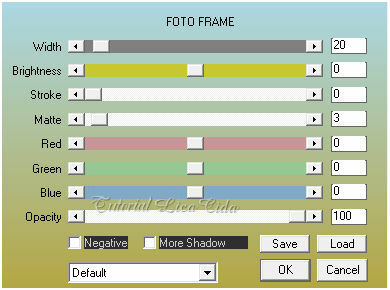 8- Image add border 1 pxl cor #foreground. Image add border 40 pxls cor #ffffff. Preencha com o gradiente formado. 9- Promote Selection to Layer. Invert. Effects \ 3D Effects \ Drop Shadow 1 \1 \ 75 \ 30,00. Color=000000. 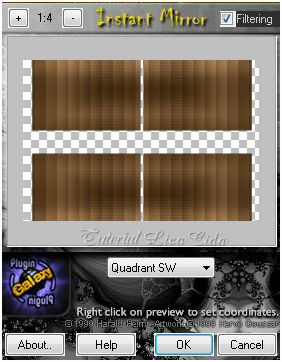 Effects\ Image Effects\ Seamless Tiling: Default. 10-Edit Copy no tube Tocha24017 \Paste As New Layer.Posicione \ Resize a gosto. 11-Edit Copy no tube aclis_vases_01_10_07_2012\ Paste As New Layer. Posicione .